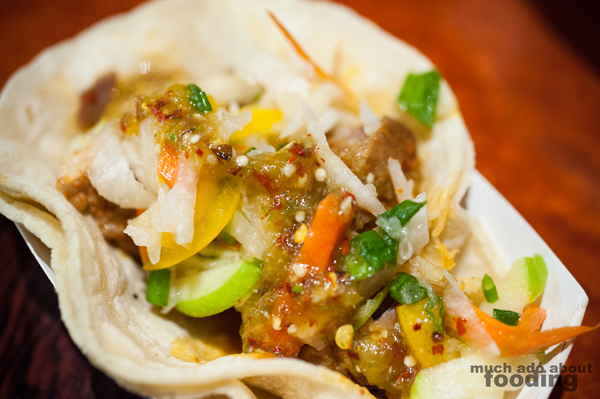 What better way to celebrate Thanksgiving weekend than a post about the smorgasbord of food Duc and I got to eat when we went to a private tasting of the new OC food truck Kala Truck? 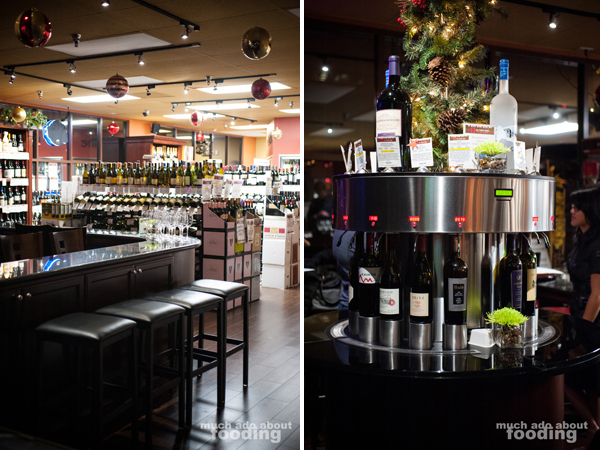 The tasting was hosted at the OC Wine Mart from which we had received invitations from the owner, Julie. Ever the gracious hostess, Julie gathered together several bloggers, media people, and Elite Yelpers for an evening to remember. 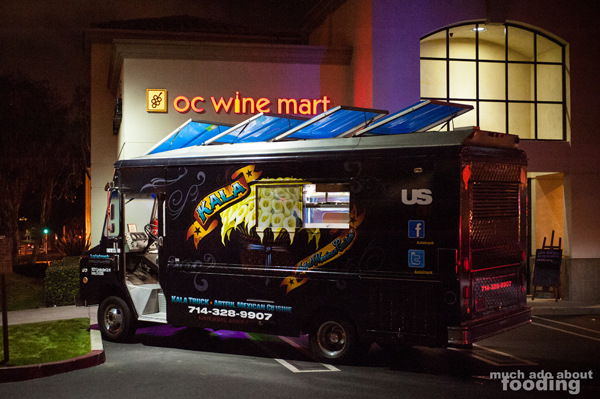 Attendees also received a $10 OC Wine Mart tasting card from Kala Truck as well! It was great to see so many people there that I knew and to be in such a perfect space for an evening of fun tasting. 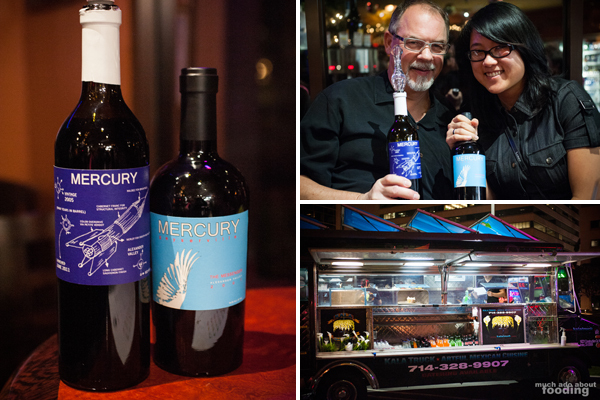 Did you know that the OC Wine Mart was recently listed as one of the top wine bars in America to visit? I think a big part of it has to do with the snazzy enomatic sample wine bar open to guests. We sure enjoyed it. Anywho, the Kala Truck allowed us to try out their entire menu! 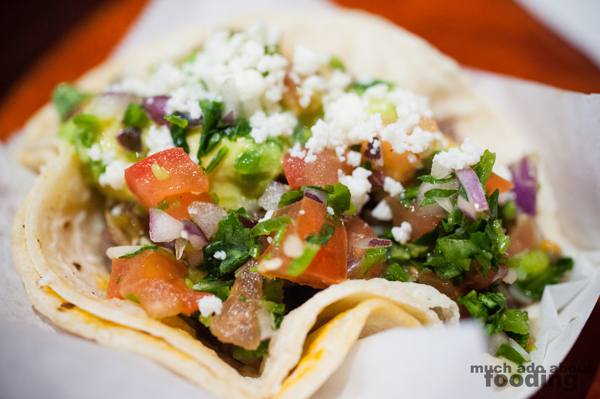 Let's get down to the business of talking food - the tacos can start. We had the El Patron Tacos (tender steak marinated in Patron and lime and topped with pico de gallo, queso fresco, and guacamole), Sweet Piggy Tacos (slow-cooked pork shoulder with ancho chile, caramelized onions and pineapple served with crunchy jicama slaw), and Cajun Shrimp Tacos (spicy grilled shrimp dressed with Poblano cream sauce atop finely shredded cabbage and cilantro). The El Patron tacos were my favorite of the three for its very, very tender steak and the zing in my mouth from its spiciness! The Sweet Piggy tacos seemed not to fit my style so much from all the sweetness of the pineapple and jicama but the texture of the slow-cooked meat was definitely desirable. 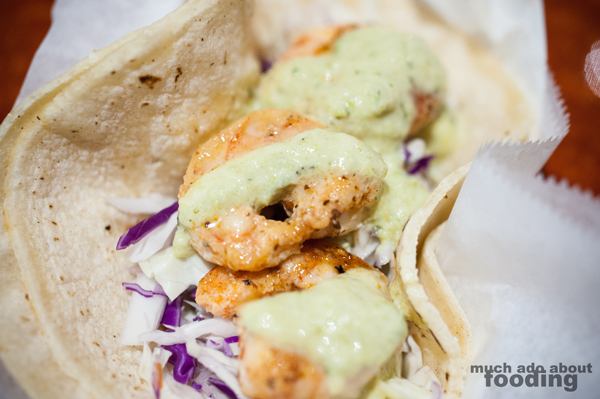 The Cajun Shrimp tacos were a bit bland to be honest but Kala Truck was definitely making themselves open to suggestions/comments so I made sure to let them know about this - I know it will be adjusted appropriately if they find multiple similar comments! If you're looking for cheesiness, you've got several options. Two of those options include the Kala Quesadilla (flour tortilla stuffed with cremini and button mushrooms, mozzarella and pepper jack cheese, epazote, and caramelized onions and served with a spicy tomatillo salsa for dipping) and the Queso Fundido (mild blend of chorizo, tomatoes, onions, and peppers grilled with Oaxaca and pepper-jack cheese until gooey and and served with truck made corn chips and topped with chunky guacamole). 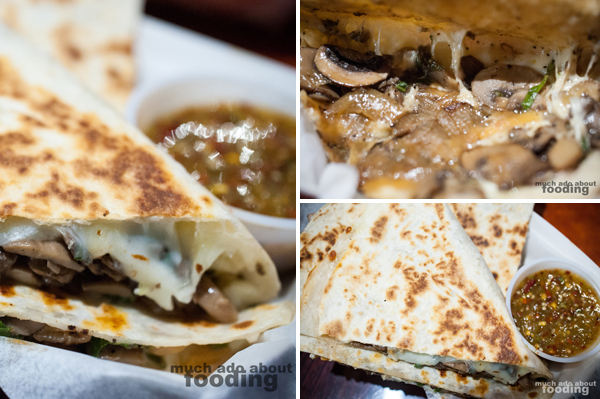 The Kala Quesadilla is a definite must for those who love mushrooms (I'm guilty of this!) and fabulous cheese; it was crunchy on the outside and savorily soft on the inside. What a perfect quesadilla! It didn't even need its accompanying sauce. The Queso Fundido, though, was probably the crowd favorite because it hit all of the great parts in a dish - sweet, salty, crunchy, gooey, and so forth. 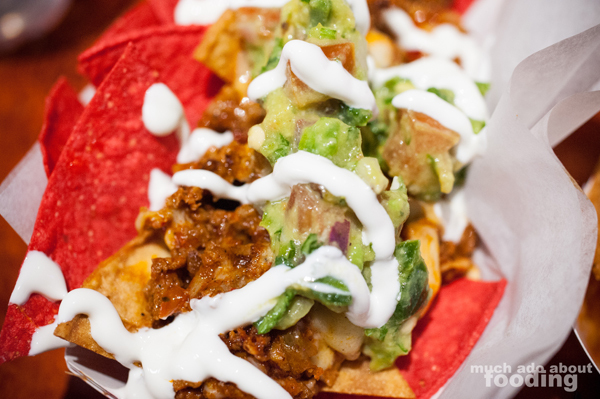 Think of nachos fancied up and ten times more delicious! 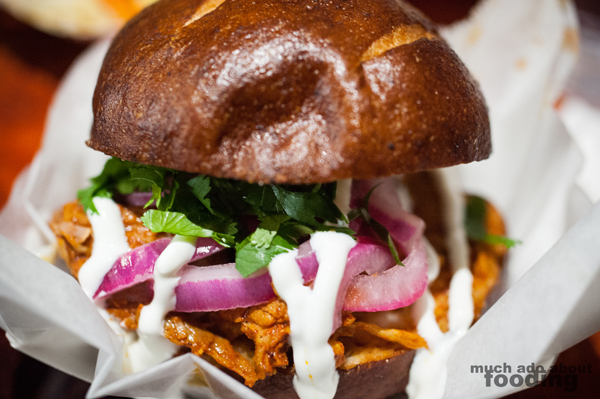 More options to choose from: the Cochinita Sliders (tender, juicy pulled pork infused with achiote and spices, served on toasted pretzel rolls and garnished with crema, cilantro, and pickled red onions), Southern Shrimp Sandwich (bolillo roll loaded with blackened shrimp, poblano cream sauce, romaine lettuce, tomatoes, and spicy radishes), or the Street-side Enchiladas (two enchiladas stuffed with your choice of either chicken or queso fresco and smothered in a rich ancho-chile sauce served atop epazote black beans and kissed with queso fresco and crema). Of course we had them all though. The sliders were one of my favorites for the evening for the truly tender pork and the crunchy roll; the flavor of their combination of spices really shone through. 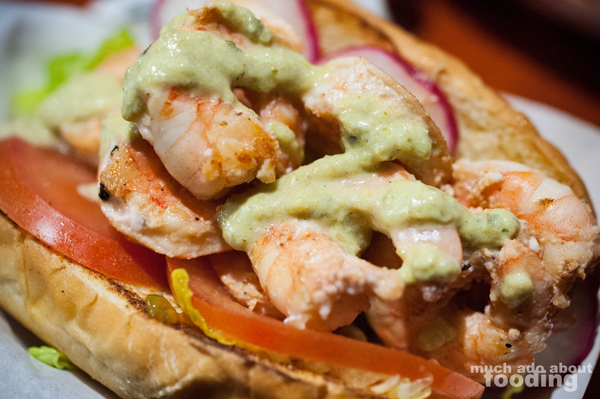 The Southern Shrimp sandwich was something that I could easily pass over unfortunately because though the shrimp was delicious here (and much better than the shrimp taco ones), the overall sandwich didn't stand out. Of the enchiladas, I only got the one stuffed with queso fresco and not chicken. Delicious filling but a soggy exterior (than preferred in enchiladas) and a sauce that could have used a little more "oomph." Let's move on to the sides offered. 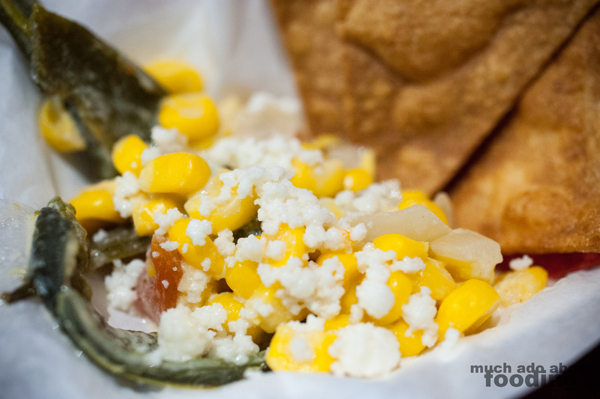 There were the Epazote Black Beans (served with cauliflower escabeche), Citrus Quinoa (with lime vinaigrette and topped with avocado, cilantro and grape tomatoes), and Creamy Roasted Poblanos and Corn (served with queso fresco and truck made corn chips). 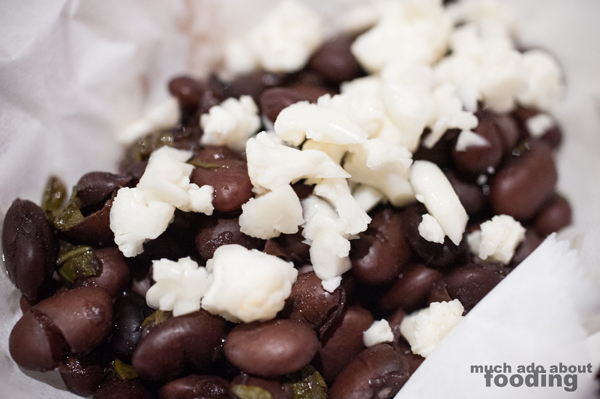 I'm not a big beans fan so I'm sure I'm biased when I say that the black beans were just okay. Texture-wise though, they were cooked to the right softness and presented well. 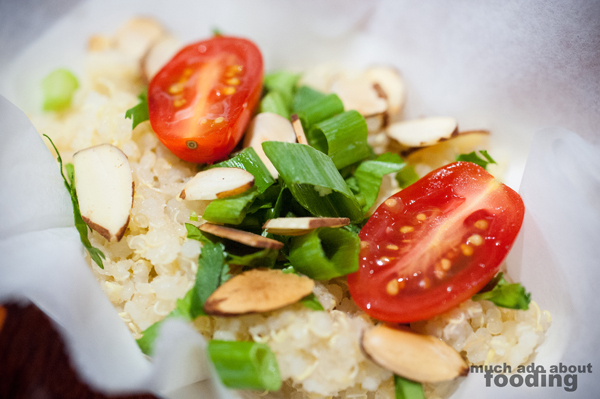 The citrus quinoa was my favorite of the sides because it had such a bright pop of a taste from its vinaigrette. The roasted poblanos weren't nearly as detectable in taste as the corn but my, was the corn delightful. It had a creamy sauce that made it enjoyable and the familiar crunch of corn is always a good way to play with your food. By the way, they have awesome chips. 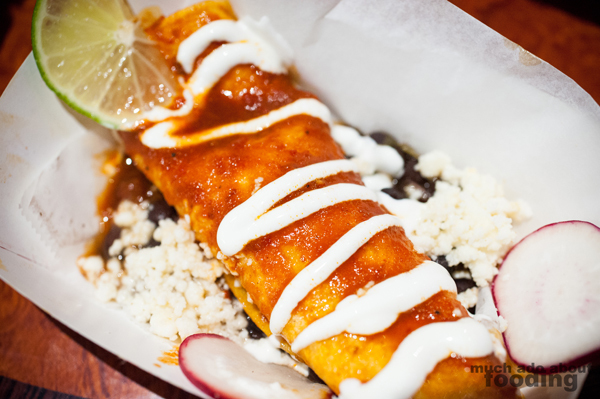 So the sweet story behind Kala Truck goes beyond their desire to just create artful Mexican food. 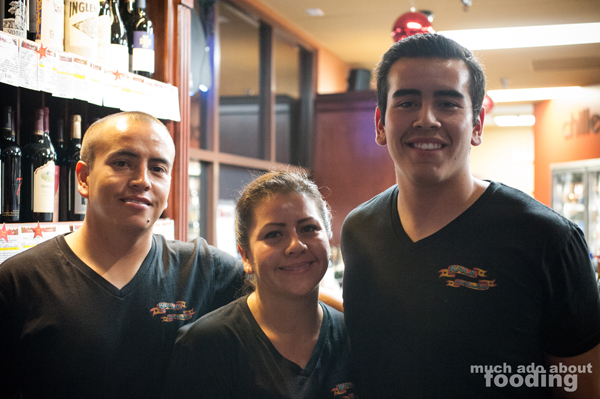 The team is a sibling trio of two brothers and one sister whose family has always been in the food truck business but not in the OC revolutionary sense we see now. Their parents used to run one of those nondescript white and blue Mexican food trucks - very casual and under-the-radar. With the burst of the gourmet food trucks in the area, the children wanted to do something different so Kala Truck was born. What a lovely team! It was also a very good night with plenty of good company and several good wines tried out. Thanks to Esteban for putting this event on, Julie for hosting, and the rest of the crew for making great food. My wishes for all the best for your food truck run and hey readers, give them a shot! The only thing I didn't get to try were their freshly made drinks but that'll have to be saved for another time - I keep getting sorely tempted by what they post online.